With labor dollars taking a very large chunk out of today’s operating budgets, taking advantage of new labor saving techniques make sense. You now have the ability to Clean & Shine your floors at the same time utilizing just one floor pad on your floor maintenance equipment for an enhanced shine with repeated use. The Scotch-Brite™ Clean & Shine Pads by 3M used repeatedly will not only clean but will enhance the shine on your floors to a burnish-like quality. This will enable the floor maintenance crew to reduce and /or eliminate burnishing completely from their operation. Utilizing the Clean & Shine pads with a low-speed automatic scrubber or 175 RPM floor machine with just water or a neutral cleaner will remove black scuff marks faster and the pads will last longer than regular floor pads under similar circumstances. Scotch-Brite™ Clean & Shine pads are not recommended for use with high speed (1500 rpm+) Burnishers or are to be used for stripping floors. Clean & Shine pads by Scotch-Brite™ can be used on most all types of flooring including VCT, vinyl, stone, terrazzo, concrete, marble, granite and rubber with either a high or low starting shine. With repeated use the shine is enhanced gradually over time. Clean & Shine pads under normal conditions will typically last approximately 450,000 sq. ft.
Scotch-Brite™ Clean & Shine pads can be used on both sides for extended use. The pads are darker on each side. You know when it’s time to turn the pads over when the surface coating of the pad is worn away and you can start to see the yellow interior of the pad. They’re easy to use and easy to clean! Prior to scrubbing any floor always dust mop to get rid of any surface debris that may cause scratching of the floor. After scrubbing the floor with just water or your regularly used cleaner just rinse out the pad with water to get rid of any dirt and debris and hang up to dry until the next use. Scotch-Brite™ Clean & Shine pads are available in all popular sizes (11 in, 12 in, 12 in x 18 in, 13 in, 14 in, 15 in, 16 in, 17 in, 18 in, 19 in, 20 in, 20 in x 14 in, 21 in, 22 in, 23 in, 24 in, 28 in x 14 in, 32 in x 14 in) to fit most all floor machines and automatic scrubbers. For a demonstration of Scotch-Brite™ Clean & Shine Pads and how they can enhance the appearance of your facility while reducing labor costs please call your local WAXIE Sanitary Supply Account Consultant at (800) 995-4466. Scotch-Brite™ Surface Preparation Pad Plus is a floor maintenance pad designed for deep scrubbing floors using just water or a neutral cleaner. 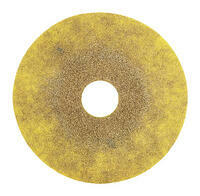 It is designed to be used on low speed floor machines, Autoscrubbers and orbital floor cleaning equipment. Scotch-Brite™ Surface Preparation Pad Plus pads used with just water or a neutral cleaner effectively strip floors of unsightly, dirty top coats of finish without the dangerous slippery surface conditions associated with using standard floor stripping chemicals. The open fiber design of the SPP Plus pad helps prevent clogging during use whereas competitive pads can get clogged with caked on dirt and finish and can interfere with floor pad performance. The Scotch-Brite™ Surface Preparation Pad Plus are now thicker and the use of a backer pad is no longer necessary. They are available in all popular sizes (12 in, 12 in x 18 in, 13 in, 14 in, 15 in, 16 in, 17 in, 18 in, 19 in, 20 in, 20 in x 14 in, 28 in x 14 in, 32 in x 14 in, 14 in x 24 in, 4 5/8 in x 10 in) to fit most all floor machines and automatic scrubbers and orbital floor cleaning equipment. 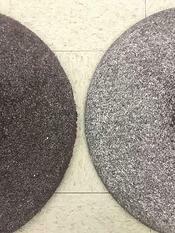 The following image shows the difference between the Scotch-Brite™ Surface preparation Pad Plus on the left and the leading competitor’s similar floor pad as represented on the right after 1,000 sq. ft. of use. The Scotch-Brite™ Surface Preparation Pad Plus is virtually in like new condition whereas the competitor’s pad on the right is noticeably dirty and clogged and in need of replacement. To learn how you can strip floors faster with lower labor costs using Scotch-Brite™ Surface Preparation Pads Plus, contact your local WAXIE Sanitary Supply Account Consultant at (800) 995-4466.